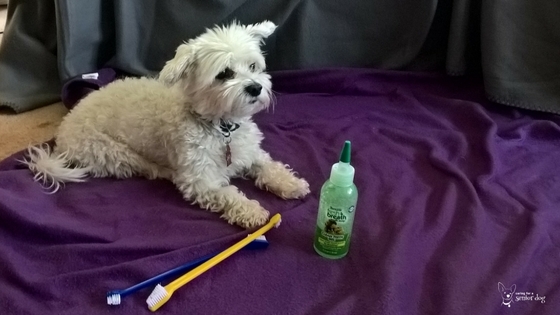 Do you know how to choose the best toothbrush for a dog? Do you even brush your dog’s teeth?? If you don’t you’re not alone, a lot of pup parents either don’t realise how important it is, aren’t sure how to do it, or can’t get near enough to their dog’s mouth to try! The size of your dog – bigger dog, bigger teeth, bigger brush. Having said that you may find your dog is so easy going you can easily brush his teeth, and do a great job with a smaller head. The head on a doggie toothbrush is angled differently, made specifically for the shape of a dog’s mouth. Make sure it’s comfortable for you to hold. The handle on a human brush tends to be shorter so it could be a harder reach, particularly if you have a large dog. The bristles should be quite soft, a human baby toothbrush may be fine. Buy doggie toothpaste (or make your own), but NEVER use the human kind. Some dogs will let you do anything, including coming at them with a foreign object and sticking it in their mouth!! However if your dog is like mine that’s never going to happen. Rather than me trying to explain it in words, this video will do a much better job! Ideally you’re going to want to do it every day, but if that’s not possible for whatever reason, then the next answer would be as often as you can. Will your dog still need a professional cleaning? Even if you’re doing a great job, it’s still likely your dog will need a cleaning done by your vet. Speak to him (or her) about how often he recommends, but be sure he has a good look in your dog’s mouth during routine appointments. Toothbrushes for dogs come in a few different types, styles and sizes so there is one to fit your dog’s mouth. Like the name suggests this style has one head. This style has a head on either end – one large and one small. Perfect for brushing different sized teeth…on the same dog! This style allows you to brush both surfaces of the tooth at the same time. Yep, an electric toothbrush! Before going anywhere near your dog with it, turn it on to check the noise level because too loud could scare him. Find out the return policy before you purchase. This style is designed to brush teeth from every angle. This toothbrush fits over your finger, and is made of silicone or microfiber. Which style toothbrush for what size dog? It’s an interesting question, so I did some research. I know what I’ve tried and ultimately felt the most comfortable using, but I was curious about what others were doing and found an awful lot of conflicting advice. For example, I’ve read comments from people who believe a finger toothbrush is best for large dogs, while others thought it was a very bad idea because too much of your hand has to go into a dog’s mouth. See what I mean? I have a blind almost 17 year old Chihuahua/Min Pin named Red, and she weighs about 8lbs or so. She may be tiny but she can fight! I looked at the options and decided to try a long handled, double ended toothbrush. I liked the tiny head but couldn’t find a brush with just that size, plus I figured the long handle would keep me safe!! I bought the cheapest one I could find in case I ended up not using it, and it turned out to be a great strategy! My dog Red went ballistic every time I tried, so now I use it for cleaning around the burners on the stove! Let me clarify. There was nothing wrong with the toothbrush I got, I’m just dealing with a dog that clamps her teeth shut and nothing opens them, so the long handle didn’t give me the control I need. I read somewhere about using a flat cotton pad wrapped around a finger so I tried that. Although it didn’t go brilliantly I was at least able to get my finger on her teeth, so that was progress. I then started putting toothpaste on it and at least achieved something. Although it was a good solution for the short term, I found it would sometimes get caught on her teeth even though the pad itself was flat, nothing like a cotton ball. Because of that I decided to buy a finger toothbrush suitable for puppies and kittens. I love the finger brush style because I have a lot more control than I do with a long handled brush, which can easily slip with a squirming dog and hurt them. I’ve even had some success getting into her mouth and rubbing it on her teeth. Yes it’s still an epic battle but it’s definitely the right type for us. I can’t say enough about how important good oral hygiene is for a dog’s overall health, so I hope you find a toothbrush that works for both of you. If brushing is impossible, it’s good to know that dental chews, bones, water additives and dental wipes are all options that can help. Thank goodness Layla’s teeth are good although with her age she has lost a few but vet is not concerned so I am not. I do not use a toothbrush but use the gel and the water additive which is working fantastic for us. That’s wonderful, and I’m glad you found products that work well and don’t require a brush! Red would be grateful for that. I use a baby toothbrush as I find most of the pet ones are too big. Mr. N is pretty tolerant of tooth brushing so it works out. Mr N is such a little star, I’m not surprised he cooperates! I agree, some of the pet toothbrushes are quite big, a baby toothbrush would be perfectly acceptable for many dogs. 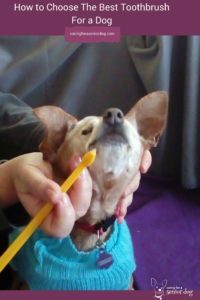 Dental health is so important sometimes people do not realize that we need to clean out pets teeth to avoid other illnesses really appreciate including a video that shows the correct way of doing this. I agree with you Adriana, many people don’t realise how important it is…yet we wouldn’t dream of going a day without brushing at least twice would we? I do hope the video helps. I can see how the electric toothbrush would get much more work done; I think dogs think we’re too weird and intrusive with the regular brushes we use; getting something noisy like that? I’d consider it if Cookie wasn’t munching on raw meaty bones. But she does. So she practically brushes her teeth for hours daily. That’s wonderful I’m thinking of trying raw bones for my other dog Jack.